Ch'iang Shan Italia Pa Kua Kung Fu Association A.S.D. Pa Kua Chang is an amazing and effective martial art. Its circular and tilting movements are comparable to the movements of an ancient mighty dragon. Part of natural healing methods from taoist masters retired on Wudang mountain, it is one of the most efficient art for healing and self defense ever created. Pa Kua Chang (Ba Gua Zhang for pynin chinese trasliteration) is part of internal chinese martial arts also known as nei jia quan. Its origins are located in Northern China, mithological connected to Wudang. In the same internal martial arts family, together with Pa Kua Chang, we find the well known Hsing I Chuan and Taiji Quan. Peculiarities of Pa Kua Chang are relaxation, smoothness, continuous movements together with the use of internal energy instead of muscular strength. All of that combined with the main uses of palm striking instead of punching, together with circular movements and rotations. Pa Kua Chang is a martial art based on particular fighting techniques based on evasive footwork to move around the opponent, and it's also a healing practice and a way towards spiritual cultivation. Pa Kua Chang, like Taiji Quan or Hsing I Chuan, is not an unique style, it has several family branches sharing similar concepts with some differences in stances or hands postures. The Cheng and Yin family styles are two of the most representatives. Pa kua chang seminar with Master Jacopo Silicani. Qi Gong seminar with Jacopo Silicani. 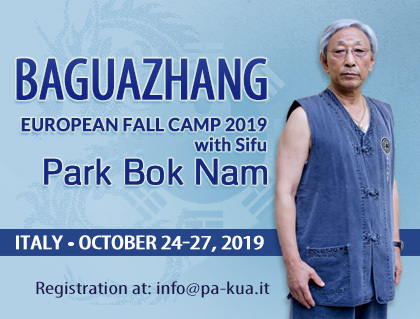 Regular Pa Kua Chang classes at Sirmione (BS). Check out the regular classes page for info about schedules and location. Searching for a Master Park's Baguazhang lineage class? Check the Official List. © Copyright A.S.D. Ch'iang Shan Italia. All Rights Reserved.